The stainless steel lower parts ensure a corrosion free life, and cleaner operation using softer leathers. "A precision machine for superior work." The generous 10.5" arm is perfect for handbags. Stitching through 30 oz of upholstery suede. 5/8" Foot Lift! Able to sew up to 1/2” of material! Differences: The CB-341 differs from the CB-227R by having a much larger bobbin, higher foot lift, and a much thicker sewing capability. Cowboy's latest machine exceeds all expectations for a industrial medium duty machine. The CB-341 has incredibly smooth and stable performance, has a huge number of optional feet, and uses a HUGE "M" class bobbin for larger projects. The Cowboy CB-341 sewing machine is capable of sewing up to 1/2" of leather, webbing, or denim, with up to #138 bonded nylon or polyester thread. The machine has a 10.5" inch long cylinder arm and uses the same inexpensive needles and presser feet as the Singer 111w and most other walking foot machines. The throat cover plate is cut off close to the left end of the arm, allowing you to sew gussets and other projects that have narrow flanges (with narrow feet). You can let shaped items hang down and sew along the back, very close to the edge. The CB-341 features a forward/reverse stitch length lever, which you pull down to back tack to lock your stitches. The positive compound feed is performed by a combination of a bottom feed dog, timed with a moving needle and moving inside presser foot. It has alternating presser feet, with the outside foot used to secure the work between stitches. This ensures that all layers move together and remain in alignment. It also guarantees consistent stitch length, due to the needle, inner foot and feed dog all pulling the material at the same ratio. 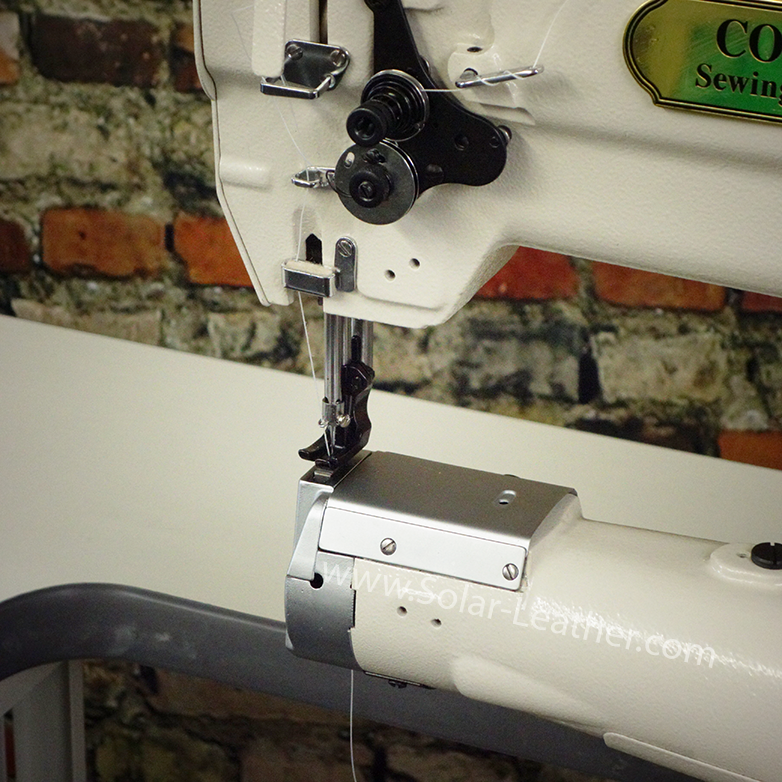 The Cowboy CB-341 is an ideal machine for sewing the edges of belts, straps, pancake holsters, shaped and round cases, purses, hats and caps, backpacks and heavy garments (like jeans). This is also a perfect machine for sewing around arm holes, hems and cuffs on both cloth and leather garments, as the circular work can freely revolve around the cylinder arm. Stitching through 24 oz of Buffalo Veg-tan here. Checkout the HUGE m class bobbin!